New ETS Burn victim bank version 4! A new ETS burn victim bank version is now released! The Emergo Train System Burn victim bank consists of a total of 100 patients with various degree of burn injuries and is developed for the purpose of running simulation exercises were the scenario results in a number of patients with burn injuries. All patients in the Burn victim bank version 4 have undergone a complete medical review and update. 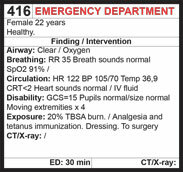 More parameters have been added which means that patients can be designed to fit different triage systems. A revision has also been made in the patient outcome burn categories. It is now also possible to evaluate patient outcome 30 minutes after injury instead of 1 hour! 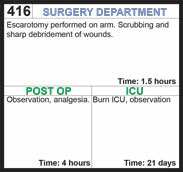 The burn victim bank is available in medium (100 patients/management cards) and small set (50 patients/management cards) and includes patient outcome template for burn injuries and stickers for sitting position and escarotomy.